I reacted “live” to the news as it was rolling in, frantically putting books on hold at my local library as they were announced. We had already mentioned the Caldecott winner, Wolf in the Snow, in one of our round-ups in the fall. And Out of Wonder, the Coretta Scot King Illustrator Award, appeared on the same of our round-up, too! Here are some of the other picture books that garnered some attention last Monday. 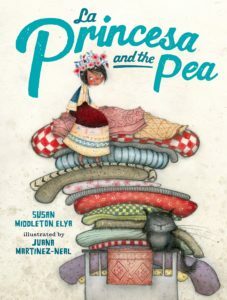 La Princesa and the Pea by Susan Middleton Elya and illustrated by Juana Martinez-Neal. Pura Belpré Illustrator Award winner. The Princess and the Pea gets a spunky Latino makeover in this charming picture book. Text seamlessly blends English and Spanish words together. Illustrations depict traditional Peruvian textiles in warm colors; alpacas, burros, and other Peruvian details add to the scenes. 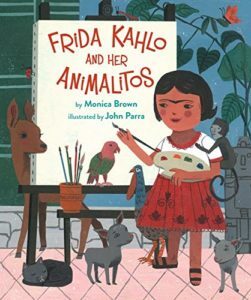 Frida Kahlo and Her Animalitos by Monica Brown and illustrated by John Parra. Pura Belpré Illustrator Award honor. A colorful picture book biography that weaves Frida Kahlo’s many pets throughout an introduction to her life. A good introduction to this Mexican artist. Silent Days, Silent Dreams by Allen Say. Schneider Family Book Award for Young Children winner (for books depicting disabilities). 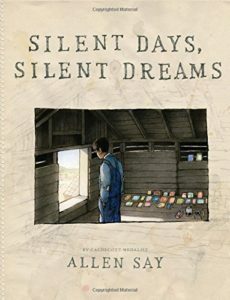 Say’s account of a mute, autistic artist and his troubled childhood is evocatively told and illustrated. While it was given the award for ages 0-8, the best age range for this sobering and thought-provoking tale is closer to middle school. 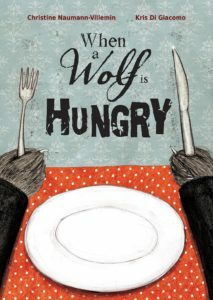 When a Wolf is Hungry by Christine Naumann-Villeminn and illustrated by Kris Di Giacomo. Batchelder Award honor (for books in translation). Picture book imprints are often quirky, a reminder that we take cultural nuances and humor as universal. When a Wolf is Hungry follows suit as a wolf keeps trying, in vain, to make it to an apartment to, um, eat its occupant. Humorously deterred, he ends up moving in to the apartment building and becomes a vegetarian. 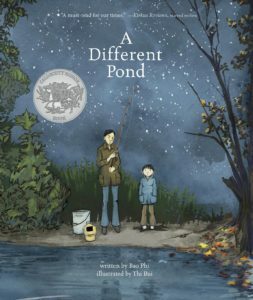 A Different Pond by Bao Phi and illustrated by Thi Bui. Caldecott Honor winner. I loved this charming memoir of a Vietnamese boy’s childhood trips to a pond to fish with his father. Warm blues and browns match the quiet tone of the text. 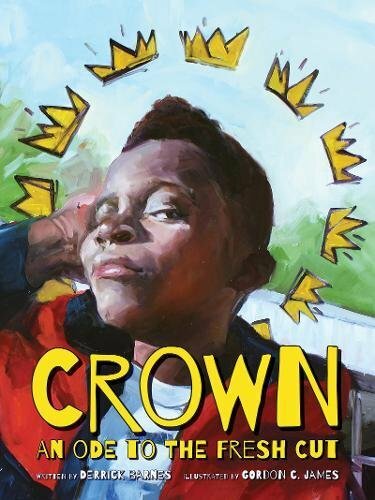 Crown: An Ode to the Fresh Cut by Derrick Barnes and illustrated by Gordon C. James. Newbery Award Honor, Caldecott Award Honor, Coretta Scot King Author AND Illustrator Honor. Text and illustrations radiate personality in this buoyant ode to a black boy’s experience in the local barber shop. It’s refreshing to have a picture book celebrating a particular culture’s beauty rather than assuming all children everywhere–regardless of cultural or ethnic background–have the same standards. And it’s refreshing to see a celebration of black culture that isn’t based on slavery or the Civil Rights Movement, important as those are. There’s so much more! What was YOUR favorite picture book award winner this year? As always, book cover images are from amazon. I was unfamiliar with Frida Kahlo until last year when I read about an exhibit at the Dali Museum in St. Petersburg FL. Thursday evenings admission was free (a great saving! ); husband and I attended and WOW! it was terrific. Now Frida’s ANIMALITOS book will be the gift for a granddaughter’s 5th birthday in June. All these books look interesting; we have three other granddaughters 13, 9, 7. Thanks for your recommendations.